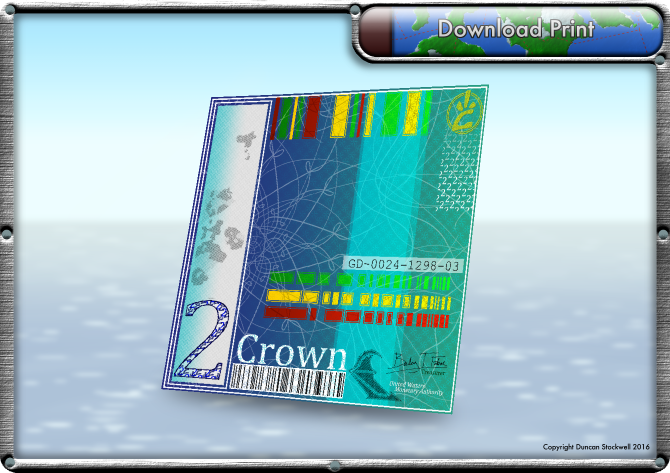 Here is the 2 Crown note used in TideBreakers. I took a lot of inspiration from the Swiss Euro and Australian Dollar banknotes as both have nice, bright colours and distinctive designs. As the Crown notes are only one-sided at the moment I decided against depicting a famous person or landmark, though I may design the reverse side at some point in the future. For now I figured that as the currency in TideBreakers is largely electronic – with transactions being completed by loading money into the ‘palm-spaces’ of a person’s handphone – it may be unnecessary to even have a reverse side of the note anymore, as they would only ever be seen in hologram; i.e. one-sided. I doubt cash would have completely gone out of use by the time-period TideBreakers is set in though, so it’d be nice to complete that design exercise if I get a chance in the future, if only so I can print some off myself!